Sony Corporation today announced the upcoming release of the ECX339A OLED Microdisplay featuring UXGA (1600 x 1200 resolution), the highest in class for a 0.5-type. This product achieves the world's smallest pixel pitch of 6.3μm by leveraging Sony's OLED display technology and miniaturization technology, enabling a resolution 1.6x higher than the previous model1. By employing a new drive circuit design that operates on half the voltage of the previous model1, the new product achieves the same level of low-power operation as its predecessor but with much higher resolution. When paired with Sony's original driving system2, a frame rate up to 240 fps is supported—double that of previous product1. ECX339A 0.5-type OLED Microdisplay will start shipping January 2018, mass production at November 2018. Enhancing the resolution on microdisplays has traditionally presented problems such as deteriorating image quality due to decreased pixel pitch and inferior viewing angle properties. The new product features optimized transistors layout and process to address uneven characteristics and loss of withstand voltage, the issues associated with transistor miniaturization. The Sony original variation compensation circuit also enhances picture quality. Additionally, the color filter is deposited directly on the silicon substrate, reducing its distance from the light emitting layer, and the filter's color array has been modified. This helps to secure the viewing angle properties while achieving high resolution. 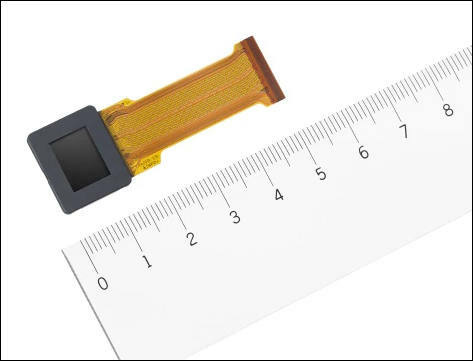 OLED Microdisplays are widely used in digital camera electronic viewfinders (EVF) for their superior high contrast, high color gamut, and high-speed responsiveness. Sony, having achieved this high resolution and high frame rate, now offers even more realistic image display and accurate capture of subjects for use in high-end cameras that demand extremely high image quality. Going forward, Sony expects this high-definition OLED Microdisplay to be employed in a diverse range of fields and applications such as AR (augmented reality) and VR (virtual reality) head-mounted displays. The new product has achieved the world's smallest pixel pitch of 6.3μm by leveraging Sony's proprietary OLED display technology and miniaturization technology, and has superior resolution 1.6x higher than the previous model*1. Generally, transistor miniaturization results in characteristic variation and reduced withstand voltage. This product uses a Sony original compensation circuit and optimized layouts and process for each individual transistor to address these adverse effects. Furthermore, the color filter is deposited directly on the silicon substrate, reducing its distance from the light emitting layer, and the filter's color array has been modified to secure the viewing angle properties while achieving high resolution. A new drive circuit design supports a high frame rate of up to 240 fps2, nearly double that of its predecessor1. This has made it possible to capture fast-moving subjects in the viewfinder with higher accuracy, so users will not miss a photo opportunity, delivering a more comfortable shooting experience. In head-mounted display devices, this will help to improve image delay issue for items superimposed on real-world vision of AR and to avoid motion sickness during usage of these kinds of devices. By employing newly-designed peripheral circuits that operate on half the voltage of previous model*1, the new product delivers the same low-power operation as its predecessor when operating at the same frame rate, despite the nearly 1.6x increase in the number of pixels.